One saying is like this: once, 500 Lamas were playing music for a fiesta in zhaomiao. Suddenly, a gale whirled and flying stones and sands covered the zhaomiao. Another saying is that: in ancient times, Zhang Guolao, one of the eight gods, carried a bag of sand with his donkey. The lid of the ban was loosened and the sands covered the temple at night. 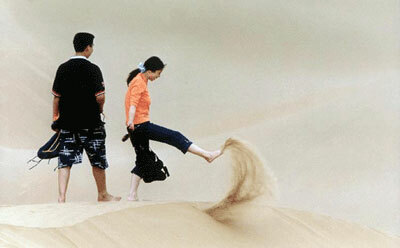 When sliding in the sand, it seems that people could hear Lamas playing music and reciting scriptures under ground. The story represents the cultural effects of a Mongolian-populated area. It is said that there was a <?xml:namespace prefix = st1 ns = "urn:schemas-microsoft-com:office:smarttags" />zhaomiao Temple called "Yinkenzhao" buried under the sands.